Grumpy Gamer - What is an Adventure Game? 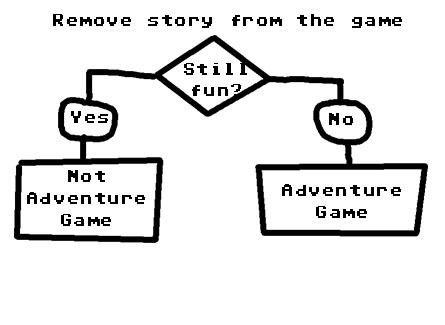 What makes an Adventure Game an Adventure Game? Is Limbo an Adventure Game or just a puzzle game? Some people called L.A. Noir an Adventure Game but it lacks some of the basic components of an Adventure Game. Or does it? Why do we call them Adventure Games? If you faithfully made Monkey Island into a movie, I doubt it would be called an Adventure Movie or even an Action/Adventure Movie. 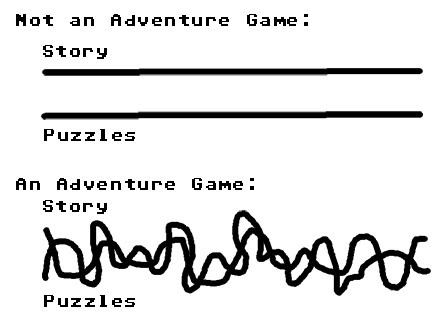 I guess we call Adventure Games Adventure Games because the first one was call Adventure. I see no other reason they are called Adventure Games. Semantics aside, what makes an Adventure Game an Adventure Game? Inventory? Pointing? Clicking? Story? Low Sales? What is three + four + four?